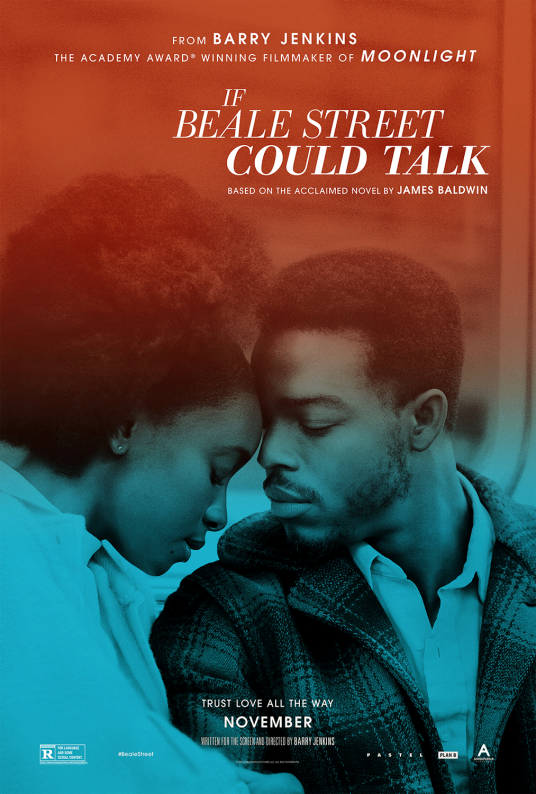 Join us for a preview screening of If Beale Street Could Talk, Academy Award–winning director Barry Jenkins’s ambitious adaption of James Baldwin’s 1974 novel. Set in Harlem in the early 1970s, If Beale Street Could Talk is a timeless and moving love story of both a couple’s unbreakable bond and an African American family’s empowering embrace, as told through the eyes of 19-year-old Tish Rivers. Tish vividly recalls the passion, respect, and trust that have connected her and her fiancé Alonzo Hunt, who goes by the nickname Fonny. The devoted couple dream of a future together, but their plans are derailed when Fonny is arrested for a crime he did not commit. Tish knows that Fonny is innocent yet is mindful that his good friend has only recently been freed after an unjust incarceration. While Fonny’s mother clings to piety and his father grapples with feelings of powerlessness, Tish’s earthy father Joseph and fierce older sister Ernestine are unwavering in their support. Even more eager to clear Fonny’s name is Tish’s deeply compassionate mother, Sharon, readying to put herself on the line for her daughter and future son-in-law’s happiness—and for the couple’s unborn child, whose arrival will herald new joys and challenges. “In a filmmaking style that approaches music,” according to Cameron Bailey of the Toronto International Film Festival, director Barry Jenkins honors James Baldwin’s prescient words and imagery, charting the emotional currents navigated in an unforgiving and racially biased world and poetically crossing time to show how love and humanity endure. Starring KiKi Layne, Stephan James, Emmy Award winner Regina King, Tony Award and Emmy Award nominee Brian Tyree Henry, Aunjanue Ellis, Michael Beach, Colman Domingo, and Teyonah Parris. This screening is presented in conjunction with the exhibition Time is Now: Photography and Social Change in James Baldwin’s America, on view at the Carpenter Center for the Visual Arts through December 30, 2018. Guests are invited to visit the Time is Now exhibition until the screening begins at 6pm. Co-sponsored by the Carpenter Center for the Visual Arts, the Hutchins Center for African & African American Research at Harvard, and the Harvard Art Museums. The screening will take place in Menschel Hall, Lower Level. Please enter the museums via the entrance on Broadway. Doors will open at 5:30pm. Support for this program is provided by the Richard L. Menschel Endowment Fund. Time is Now: Photography and Social Change in James Baldwin’s America is co-organized by the Carpenter Center for the Visual Arts and the Harvard Art Museums, and is curated by Makeda Best, the Richard L. Menschel Curator of Photography at the Harvard Art Museums.